The 7nm chip that SemiAccurate has been talking about for a while is of course Qualcomm’s X24 modem. We saw it running before MWC, at speed, in a handheld form factor. Word of dozens of 7nm tapeouts from various foundries has come our way over the past six months, but the Qualcomm X24 modem was the first one we have seen in the flesh. Not only that, it was the first one we have seen running, and to our knowledge, the only 7nm device publicly shown running at speed. And what speed it ran at, but lets not get ahead of ourselves. 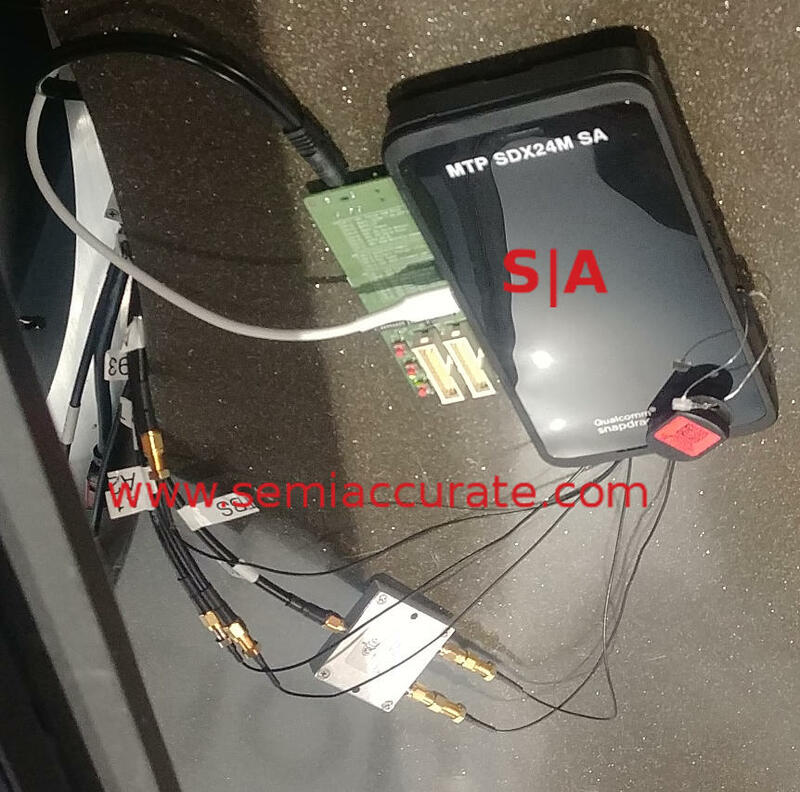 The picture you see above is the X24 modem test rig called MTP SDX24M SA, that much is written on the case. It is a 7nm device from an undisclosed foundry which we strongly believe to be Samsung. Either way given that all three foundries are pretty close on 7nm, where it comes from is largely idle talk until we have specs on all three processes. That brings us to the performance, and as you can see it performs pretty well. GbLTE which launched a little over a year ago was seen running at nearly 1Gbps, 979Mbps to be exact, both in the lab and nearly that fast in the wild. No quibbles about marketing taking over tech in naming conventions there. 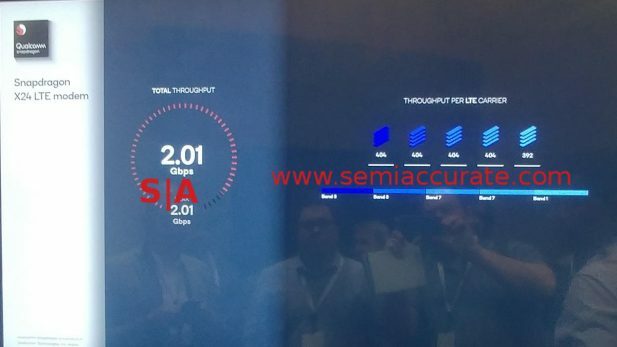 With the X24, shown to SemiAccurate almost exactly one year after the GbLTE public launch, they blew it away with 2.01Gbps. For the technical it is 5x 400Mbps carriers and the device is sampling now, out later this year in devices. Between the two we have the Snapdragon 845 SoC with it’s X20 modem capable of 1.2Gbps which is on the market now. If you think this is easy, do recall that the next closest modem competitor, Intel, works at a mere 600Mbps. Since the X24 is said to be shipping in Q4 of 2018 or so, it is likely that Qualcomm will be at 2Gbps before the competition gets to 1Gbps. That brings us to the question of why such a big leap? The normal cadence of 1Gbps, 1.2Gbps, 1.4Gbps… would be more than acceptable in light of spectrum scarcity and phone upgrade cycles. A 40% speed bump, likely unachievable in the real world bar a handful of locations, every two years is not a bad upgrade path. So why the massive leap to 2Gbps? There is a good reason for that.